I ARRIVE at Gaia Retreat & Spa stressed and tense after a long drive and a month of work deadlines. Three days later I leave relaxed, rejuvenated and, there is no other word for it … joyful. The underlying calm still hasn’t left me, not even now I’m back to my caffeine-fuelled, busy ball-juggling life. I defy anyone to visit this hidden retreat set in the jewel green hills above Byron Bay and not leave walking on air. 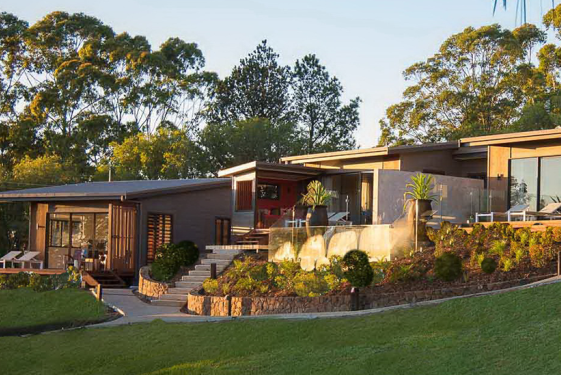 Ten years ago Olivia Newton-John and co-owner and GM Gregg Cave (together with two other founders Ruth Kalnin, and Warwick Evans) created the retreat to offer innovative therapies in a nurturing environment; a decade later it is one of Australia’s most sort-after sanctuaries. The laid-back luxury it offers, what Newton-John calls 'a combination of bare foot and Armani”, is hard to find elsewhere, as is that certain something - the ‘Gaia factor’ - that seems to work small miracles on all its guests. The resort is made up of a main building with lounge and restaurant, and individual suites dotted around the lush sub-tropical gardens. Stunning new villas on the top of the hill have views of the surrounding hinterland and private plunge pools. As I sit on my villa verandah the sheer beauty of the surroundings takes my breath away. When Cave and Newton-John first found the property. “We were immediately struck by the peace and tranquillity here,” says Newton–John. “It just seemed very special. Everyone who stays here seems to feel the same. You can tell newbies by the set of their jaw but within a few hours they’re wandering around in yoga gear or track pants visibly relaxed. The name ‘Gaia’ means Mother Earth, it was what Newton-John called her first solo album. “This is a place where you can communicate with nature and get a sense of spirituality, and what is really important in life – that’s why Gaia is the perfect name” she says Gaia welcomes guest with open, and forgiving, arms unlike the drill sergeant approach of some (very upmarket) health spas I’ve endured. Daily activities are offered for those who want them and specialised private programmes can also be arranged but Gaia doesn’t dictate, she encourages. And there’s definitely more than a wilted lettuce leaf for lunch. The food at Gaia, created by head chef Dan Trewartha, is spectacular. “Who would have thought” said my husband in wonder, “that I would actually enjoy eating a Brussel sprout”. Much of the organic fare is plucked from Gaia’s own garden or sourced from local farmers and the fertile orchards and plantations of the NSW Northern Rivers region. Guests drift between the spa, the yoga room and the gym, or relax on their balconies. An early morning walk takes me to the lookout which is the highest point in the shire. The name means ‘the wind of God’ in Sanskrit, although this morning there is only a gentle breeze. From here I can see across the undulating hills and valleys from the ocean to the Nightcap ranges. At some point everyone always ends up in the main Kukura House, to relax in the library area or on the wide sunny verandah with a tea and a homemade muffin (yes they are allowed). Buddha paintings and eastern statues blend with modern sofas and lamps, while sweeping floor to ceiling silk curtains are hand–dyed in warm shades or rose and burnt orange. Olivia and Gregg have put a lot of love into Gaia and some of their own belongings too. The Jim Thompson silk brocade love seat in the lounge came from Olivia’s home and the books all belonged to her mother, Irene Newton-John. Some of Gregg’s favourite books grace the shelves of the guest villas. All these personal touches make it easy to relax here. So do the staff. Good service is hard to define but the Gaia staff are exceptional, walking that fine line between friendly and professional that is so easy to get wrong. Their warmth and encouragement is the essence of Gaia personified. The healing heart of Gaia is the Amala Spa which means ‘pure’ in Sanskrit. To ensure that treatments are also pure in practise Gaia has just launched its own organic range because Gregg simply couldn’t find anything good enough which was already on the market. 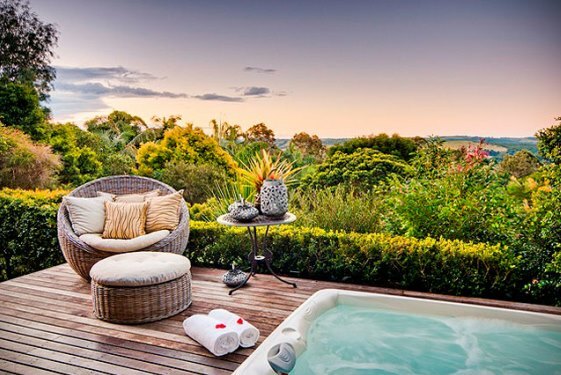 The best Byron Bay practitioners – and in Byron there are a few to choose from – have been enlisted to offer a range of treatments from facials to sound healing. A facial with Gaia's own Certified Organic skin care range has my skin nourished with a blend of Kakadu plum and cocoa butter, hydrated with Banksia and green tea and polished to perfection with extract of lilly pilly. lychee shell and liquorice. Afterwards my skin feels as soft as an organic peach. Insider Secrets: Olivia Newton John has been coming to this part of the world for over 30 years. The Little Things: The staff really care - actually that's a BIG thing.